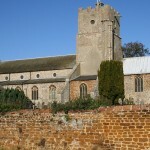 The much loved Church of St Mary the Virgin was built in the 13th century, making the church the oldest building in the village. It is a true reflection of the village’s history since it stands very much at the heart of the village. The church is surrounded by many buildings made from local chalk, carrstone and a terracotta brick once manufactured in the village. 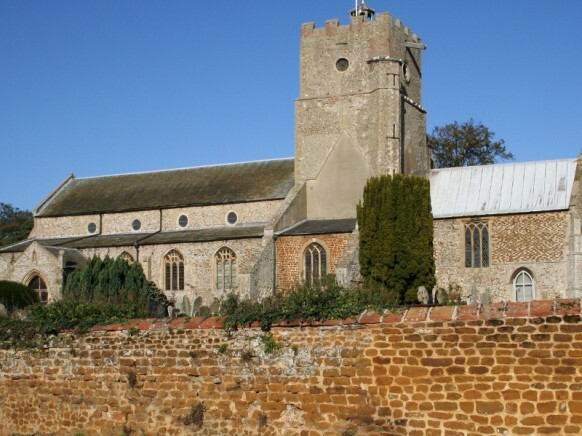 Churches designed like St Mary the Virgin of Heacham, with a central tower built on the crossing, are a rarity in Norfolk as buildings designed in this manner required a strong foundation base using good strong building stone. Buildings of this design often collapsed because of poor quality local stone. Others were reduced in height, but St Mary’s has survived more than 800 years. In the photograph (middle right) you can see how transepts rising to a great height were designed to support the tower, but these transepts were not well maintained over the years resulting in the extraordinary buttress on the north side being built to support the tower circa 1800. The church belfry has circular openings on each side which appear small in proportion to the massive tower. This particular feature of the church indicates its great age as belfry openings grew in size over time. A cupola crowns the top and contains the original 12th century bell – regarded as the oldest in East Anglia. Glorious Byzantine style brass lanterns hang from the ceiling identical in design to those of the Basilica in St Marks Square, Venice. The choir stalls and reredos were donated by Charles Strachan. They were made from oak from the Heacham Hall estate. The Strachan memorial is located in the south west corner of the chancel. Psalm 47, verses 6 and 7 are quoted on the stalls. Panels of wood carving on the pulpit were provided by Ada Rolfe in memory of her husband. A soft sandstone which hardens with age – local carrstone – has been used in conjunction with other stones in the building of this church. The church is partly 12th century whilst the main structure was added in the late 13th century. The south porch and clerestory were added in the early 15th century. In 1894 a Victorian west gallery and small organ were dismantled, as were the box pews. In 1928 restoration work took place. This involved the removal of a false ceiling in the nave and chancel (dating from 1800) and the removal of the infilling of the chancel arch. The stained glass in the tracery of the aisle windows is 19th and 15th century. There are many interesting memorials in the church which are well worth reading. One such memorial is an unknown knight in armour made of London brass (1485). The figure stands 27 inches and, unlike many Norwich made brasses, is not deeply etched. The north clerestory wall hatchments display the arms of three local gentlemen. Opposite on the south wall are the arms of their widows. St Mary’s church organ was built in 1914 by T R Spurdon Rutt & Co of London for the East Finchley Congregational Church. 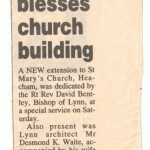 It arrived in Heacham in 1970 with assistance from local organ builders, A J Shaw & Sons. In 1992, the organ was improved by Holmes & Swift. It now has 3 manuals with electro-pneumatic action. In recent years the pews in the central part of the nave were replaced with individual chairs and a raised carpeted platform was created at the front/altar. These changes enabled the building to accommodate concerts, holiday clubs, harvest suppers and occasional café style morning services. An extension was added to the north elevation of the church in the early 1990s, providing a small meeting room, a kitchen area and toilets with disabled access. Designed by RCF Waite & built by Chas D Allflatt Ltd.
Coats of arms of prominent members of the Rolfe family are located inside St Mary’s Church, Heacham. A sculpture of Pocahontas in Jacobean dress by Otillea Wallace, a pupil of Rodin hangs on the wall above a plaque dedicated to John Rolfe’s father. Pocahontas also features on the Heacham village sign. St Mary’s 2009 Flower Festival achieved high acclaim when it focussed on using only recycled items to make flower arrangements. The end results were truly stunning. The Church hopes to repeat the concept in the future. If you are visiting Heacham when the Festival is on you should not miss it. Throughout the church’s life, it has enjoyed local support and it continues to retain its place as the hub of the community. It maintains a very active congregation and has a busy and varied calendar of events throughout the year. The Village welcomed Vicar Steve Davies in 2007 following the retirement of Canon Patrick Foreman after 8 years of dedicated service.